The The Annex Motel and Cafe and the Historic Belvedere Café, Motel, and Gas Station. A vintage-styled Welcome Center with the Vic Suhling Neon Sign and Jubelt’s Bakery. 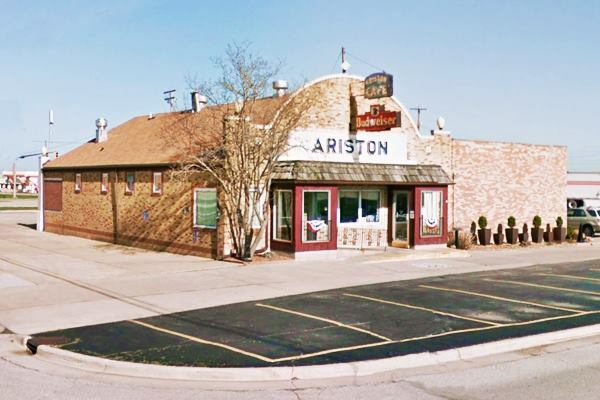 But don't miss the Historic Ariston Café or the Sky View Drive In Theatre both of which are US 66 Hall of Fame inductees. Elevation: 693 ft (211 m). Population 6,939 (2010). Time zone: Central (CST): UTC minus 6 hours. Summer (DST) CDT (UTC-5). Litchfield is a town on Route 66, in Montgomery County in Illinois. (Map of Litchfield). Human beings have lived in Illinois since the retreat of the glaciers at the end of th last Ice Age some 12,000 years ago. Few settlers lived here in the early 1800s. At that time Kickapoo Indians lived here. They were displaced after, to the west into Missouri by settlers. Congress awarded land to the 1812 War veterans 160 acres of "Soldiers Bounty Lands" in the Territory of Illinois, some of which was in what would become Montgomery County. Named after the founder of the town E. B. Litchfield. The surname comes from an ancient Briton name which during the Roman conquest of Britain became known as Letocetum. It means ‘gray wood. Welsh (a Briton language) recorded it as llwyd 'gray' and coed 'wood'. Anglo English morphed it to 'Licced'and added feld ‘pasture’: a clearing in the forest. Montgomery County was created in 1821 and named for General Richard Montgomery, an American Revolutionary War hero, killed in 1775 during a failed attempt to capture Quebec, Canada. In 1853, The Litchfield Town Co. was established to lure the Terre Haute, Alton and St. Louis Railroad to come through the area. It did. And the town was named after Electus Bachus Litchfield born in New York, a member of the town consortium. The post office which opened in 1850 and named Hardinsburg was changed in 1855 to Litchfield. It incorporated in 1896. A town based on oil, farming and even oil production. Route 66 was aligned through it in 1930. Its Population peaked in 1960 at 7,330. Summers in Litchfield tent to be humid, warm and long while winters are short and freezing as well as windy. The average temperatures range from 21°F (-6°C) to 86°F (30°C). The average summer (Jul) high is 86°F (30°C), and a low of 68°F (20°C). The January (winter) average low is 21°F (-6°C) and the average high is 35°F (1.7°C). Litchfield is in an county that is hit by about 7 tornados per year. Tornado Risk: learn about the Tornado Risk on US 66. Check out Litchfield on our Illinois Route 66 Map, with the complete alignment and all the towns along it. 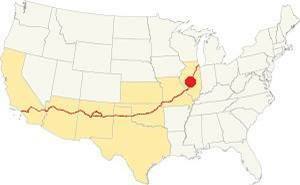 Read this detailed description of Route 66 in Illinois. 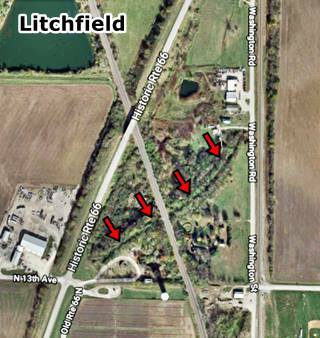 Below we provide More information on US 66 in the neighborhood of Litchfield where it is a Historic Site. In his 1946 classic "A Guide Book to Highway 66", Jack D. Rittenhouse drove along US 66 from Chicago to Los Angeles. 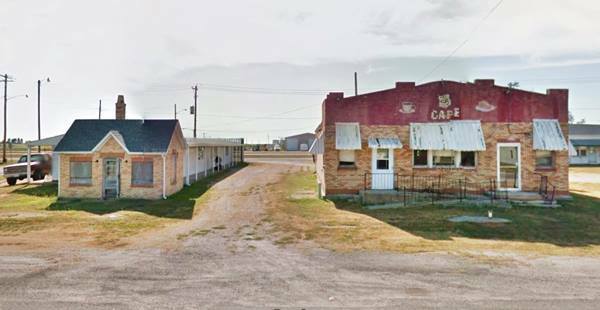 And in it he described Litchfield as follows: "gas; cafes; a few tourist cabins; garages: Hittmeier Bros. and Oldsmobile; hotel...This is an old mining town, and was also the locale of early oil production." Start at the south end of town where the 1940-77 and the 1930-1940 Historic Route 66 fork, at County Rd 1000 N. Turn right into the 1930-40 alignment and head east (north). The image shows this alignment with the Blue arrow, while the later alignment is marked with the Pale blue arrow. The signs that identify both alignments are inside the Red circle. Just 1.5 miles ahead is a Classic Motel, to your left. 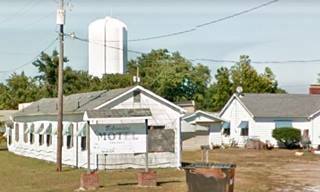 Below is a vintage postcasrd, which says "THE ANNEX MOTEL - CAFE On the Airport Beacon Litchfield, Illinois Phone 127 Thirty-two Air-Conditioned Units. Free T.V. Some Units. On Rt. 66. Only 52 miles North of St. Louis and 45 miles South of Springfield, Illinois. Excellent Food at Annex Cafe 6 A.M. to 12 P.M. Automobile Servicing at Annex Standard Station. Reasonable Rates and Real Convenience. 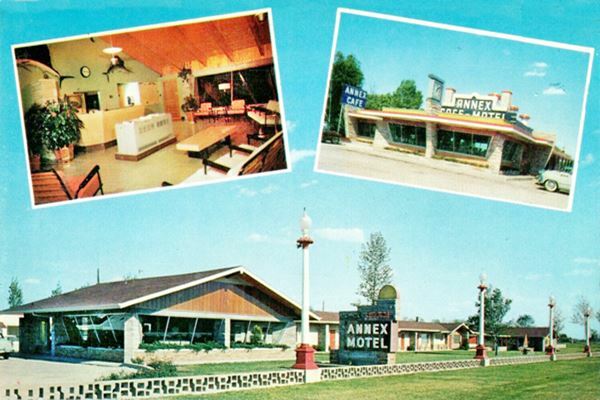 'We only LOOK Expensive'"
The Annex Motel and Cafe vintage postcard in Litchfield, Illinois. Ilinois Digital Archives, James R. Powell Route 66 Collection. Click to enlarge and view credits. Below is the current view. You can see it is unchanged, the low wall has gone, but the foundation blocks of the lamps are still there. Ran by Albino and Vincenzo Cerolla since 1929 when they built a gas station. 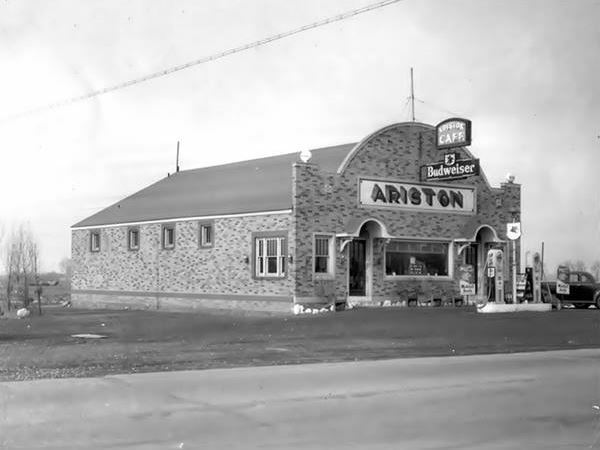 By 1936 they had built the gas station (cottage style on the left side of the image), a cafe and a small motel with four rooms. Plus their home. The café had a samll dance floor and juke box. It became a popular stop. 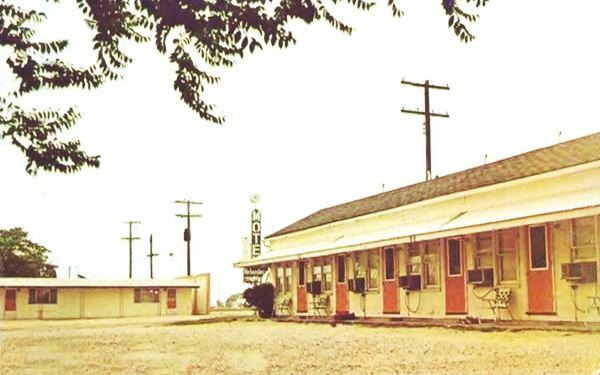 After they passed away their children ran the business expanding the motel which now also faced the new alignment to the west. However the 1970 saw traffic dwindle as it took to using I-55. The place closed shortly after. This Museum was the site of Vic Suhling's gas station. The building however is new, built with a streamline moderne retro-style. 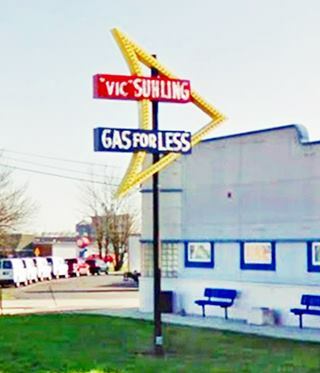 It stil preserves the restored Vic Suhling Neon Sign (see image). It also houses a collection highlighting Litchfield and its deep bonds with Route 66. Open Mon. through Sat. from 10 AM to 4 PM. Sun. from 1 PM to 4 PM. Closed Mon. Free admission. More at their website: www.litchfieldmuseum.org. A family run business since 1922. Originally in Mt. Olive and since 1952 in Litchfield. Stop and taste their pastries, cinnamon rolls and donuts! It was opened by Pete Adam in Carlinville, Illinois, in 1924. Two years later Route 66 was aligned through the town and business was good. But when he heard it would be realigned to the east, he followed the new alignment and moved his shop to Litchfield in 1929. It is probably the oldest restaurant on Route 66 and it is still open and serving meals. The name "Ariston" comes from Greek "αριστος" (aristos) and it means "the best" as in aristocrat. 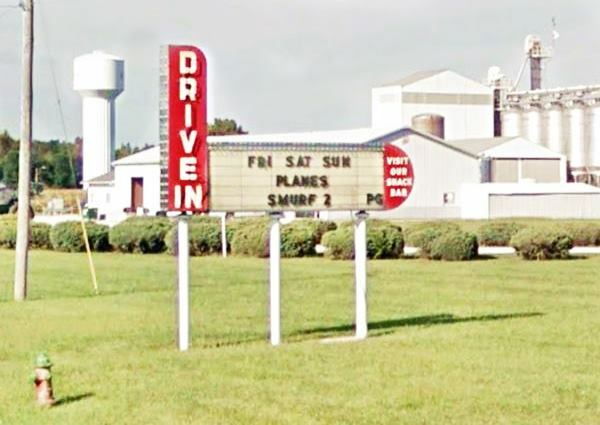 It opened in 1951 and has been operating since then, it is the last of the original drive-in theaters on Route 66 in the state of Illinois. It is also listed in the Route 66 Hall of Fame. The image shows its neon sign, and right next to it is a "Wayside Exhibit" by the Scenic Byway which tells you about the history of this icon. Donated by millionaire and philanthropist Andrew Carnegie in 1904, it is in downtown Litchfield. 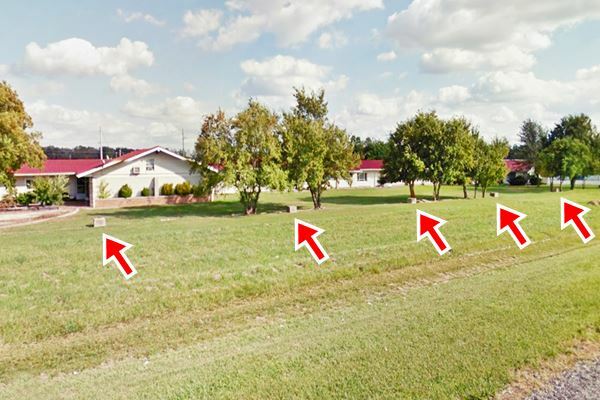 And this is its Street view. Return to the 1930-40 alignment of US 66 and continue north til it ends. Here it used to cross the railroad on a now removed bridge to continue east along Washington Rd. But to do so now, you must take a left and drive down the later 1940-77 alignment north to turn south again along Washington Rd. to drive the last segment of the original highway. Route 66 from itchfield to Mount Olive (1943-1955) is a historic highway. During World War II, failure of US 66 pavement due to heavy war time traffic in 1942 led to the implementation of the Federal Defense Highway Act of 1941, which required a freeway from Chicago to St. Louis. The images above show the original Route 66 (1930) in red and the later alignment (dashed line) and the satellite view today where you can still see the trace of the old overpass marked by the red arrows. A new 24-foot wide and 10 inch thick, two-lane road in concrete was built in 1943 just to the west of the existing highway (the 1930 US 66), and became the southbound lanes. The older higway became the northbound lanes. The road had to wait until the end of the war (1954-55) for the northbound lanes to be rebuilt on top of the original 1930 highway. A four-lane highway ran from north of Litchfield south, around Mt. Olive and onwards. These northbound lanes were abandoned after the freeway (I-55) was completed, and you can see to the east of Route 66 between Mt. Olive and Litchfield, and also to the south of Mt. Olive. In Litchfield itself, a completely new set of four lanes was added roughly one block to the west of the original alignment, bypassing the older alignment entirely. The 1958 USGS map of Decatur shows a "Four Lane - Dual" highway north of Litchfield shared by US 66 and I-55, south of the town only US-66 with its four lanes continues around Mt. Olive and west towards Livingston. 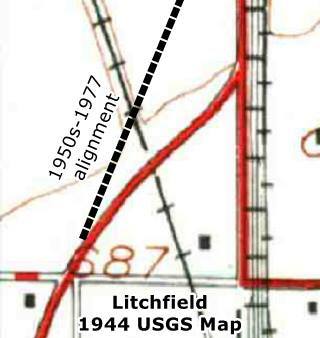 The image shows a detail from the 1944 USGS map of Route 66 in Litchfield. The alignment in red is what we now call the 1940-77 Route 66. But what we now call the 1930-40 Route 66 or "Old Route 66" is incomplete. There are several "missing" (see the Blue arrows) sections where the road does not appear on the map. We have marked them with a dotted Red line. Why is this so? Was it a WWII ruse in case the enemy wanted to know where the road was? It remains a mystery. The first alignment of Route 66 followed State Higway No. 4 from Hamel, eastbound. It runs to the west of Litchfield on IL-4 onwards past Sawyerville and into Bendl, this alignment is marked in Orange in the map above. 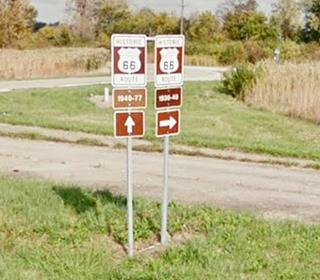 The Illinois Division of Highways chaired by Thomas Sheets moved Route 66 eastwards in 1930, this one went through Litchfield, and Mt. Olive. After Mt. Olive it met the previous alignment just south of Stanton. This alignment is shown in Blue in the map. This is a map with directions of this section in Litchfield, and also this tiny section north of town. 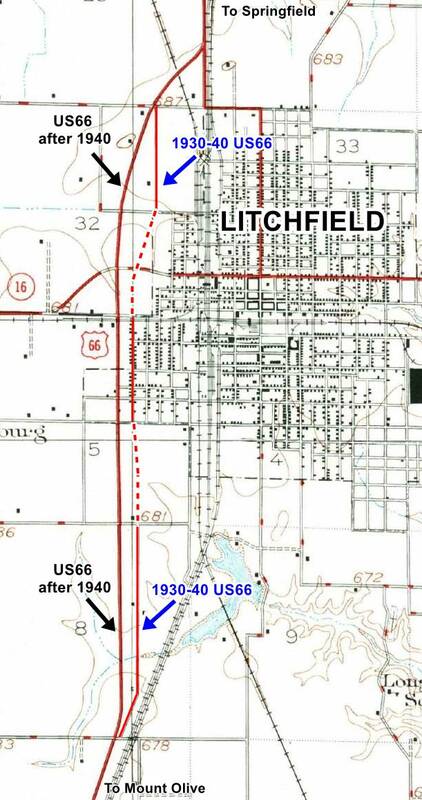 This is the Map of 1940-77 US66 from Litchfield to Mt. Olive. The lake covers 1,400 acres and there is a 300-acre park on its shores with picnic and camping areas. Hike, fish or watch birds. Enjoy the outdoors here. Just 4.8 mi. from town, see this map with directions.